Acupuncture is an ancient practice that has been used for centuries to treat all kinds of internal conditions (I especially like it for menstrual pain). AND it’s become a popular cosmetic treatment that is a super safe alternative to things like botox or fillers. I’ve been using facial acupuncture in my clinic for about 4 years now and the results are AMAZING. The treatment lasts 60 mins and in addition to acupuncture, which takes up the bulk of our time. It also includes a gua sha massage and jade rolling with serum. You will leave my office feeling relaxed and with a beautiful glow. Repeating this treatment will naturally help your skin look younger, smoother, more even toned, fuller and healthier overall. Well, when we use gua sha, acupuncture and jade rolling, we promote circulation and reduce stagnation. This encourages flow, prompting your body to push out waste and bring in fresh “supplies”. When the tiny needles puncture the skin, they create mini microtraumas that cause a mini inflammatory response. This in turn triggers your body’s repair mechanisms. That means your lymphatic and circulatory systems are stimulated. They jump into action and visit the site, bringing nutrients and oxygen to your skin cells.This helps even out your complexion and promote your skin’s glow. The positive microtraumas stimulates the production of collagen. This helps improve elasticity, minimizing fine lines and wrinkles. To finish we apply a high quality facial serum that is rich in nutrients and antioxidants to promote skin repair and boost appearance. Think of this as superfood for your skin cells. We’re currently using the Rejuvenating + Hydrating serum by Province Apothecary. 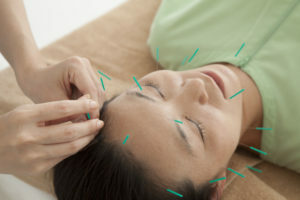 Book your facial acupuncture appointment here under ‘naturopathy’.